Rep. Joe Gresko joins Lt. Gov. Nancy Wyman and Rep. Jack Hennessy, chairman of the Veterans Affairs Committee, in hailing Richard Iannucci into the Connecticut Veterans Hall of Fame. 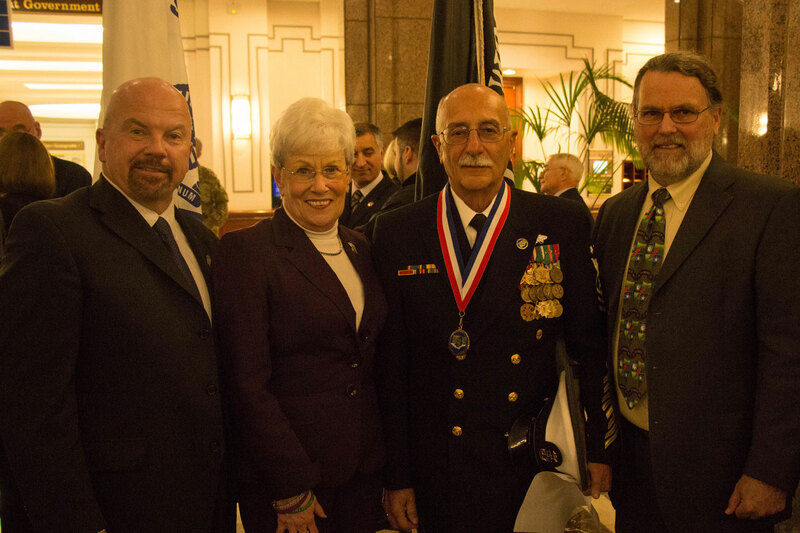 Representative Joe Gresko applauded Stratford’s Richard Iannucci’s induction into the Connecticut Veterans Hall of Fame during a ceremony Thursday at the Legislative Office Building. Gresko joined Lt. Gov. Nancy Wyman, Veterans Affairs Commissioner Sean M. Connolly, state National Guard Adjutant General Thaddeus Martin and other officials for the induction of Iannucci and nine other war veterans, who have made significant contributions to their communities after leaving the military. After a long military career, Iannucci now volunteers at the helm of Port 5, a Bridgeport organization that advocates for and celebrates veterans. As the commander, Iannucci runs the business and motivates volunteerism and community service, as well as leading fundraising efforts. He works closely with other nonprofit organizations to raise awareness of the need for programs and services to support veterans including job training, education and skill-building. Iannucci also coordinates Veterans Day and Memorial Day efforts in the community to ensure that the service and sacrifices of the men and women in the military do not go unrecognized. Currently 126 names appear on the Hall of Fame commemorative plaque that is displayed in the concourse of the State Capitol Building in Hartford.